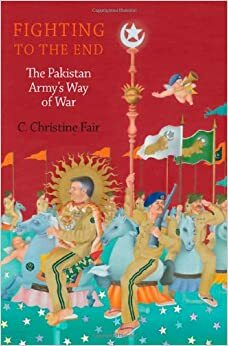 On July 28, 2014, author C. Christine Fair, Ph.D. discussed her book "Fighting to the End: The Pakistan Army's Way of War." Since Pakistan was founded in 1947, its army has dominated the state. The military establishment has locked the country in an enduring rivalry with India, with the primary aim of wresting Kashmir from it. To that end, Pakistan initiated three wars over Kashmir--in 1947, 1965, and 1999--and failed to win any of them. Today, the army continues to prosecute this dangerous policy by employing non-state actors under the security of its ever-expanding nuclear umbrella. It has sustained a proxy war in Kashmir since 1989 using Islamist militants, as well as supporting non-Islamist insurgencies throughout India and a country-wide Islamist terror campaign that have brought the two countries to the brink of war on several occasions. In addition to these territorial revisionist goals, the Pakistani army has committed itself to resisting India's slow but inevitable rise on the global stage. Despite Pakistan's efforts to coerce India, it has achieved only modest successes at best. Even though India vivisected Pakistan in 1971, Pakistan continues to see itself as India's equal and demands the world do the same. The dangerous methods that the army uses to enforce this self-perception have brought international opprobrium upon Pakistan and its army. And in recent years, their erstwhile proxies have turned their guns on the Pakistani state itself. Why does the army persist in pursuing these revisionist policies that have come to imperil the very viability of the state itself, from which the army feeds? In Fighting to the End, C. Christine Fair argues that the answer lies, at least partially, in the strategic culture of the army. Through an unprecedented analysis of decades' worth of the army's own defense publications, she concludes that from the army's distorted view of history, it is victorious as long as it can resist India's purported drive for regional hegemony as well as the territorial status quo. Simply put, acquiescence means defeat. Fighting to the End convincingly shows that because the army is unlikely to abandon these preferences, Pakistan will remain a destabilizing force in world politics for the foreseeable future. C. Christine Fair obtained her Ph.D. from the University of Chicago, Department of South Asian Languages and Civilizations in 2004 and an M.A. from the Harris School of Public Policy in 1997. Prior to joining the Security Studies Program (SSP) within Georgetown University's Edmund A. Walsh School of Foreign Service, she served as a senior political scientist with the RAND Corporation, a political officer to the United Nations Assistance Mission to Afghanistan in Kabul, and as a senior research associate in USIP's Center for Conflict Analysis and Prevention.